This blog does not try to compare all available Web Services Development Framework but focuses only on three popular approaches regarding Open Source frameworks: Apache CXF, Apache AXIS & Spring WS. 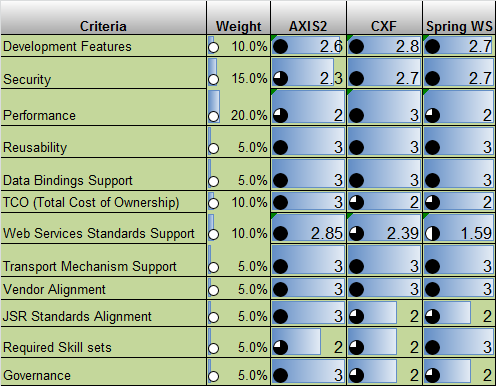 1) I'm not sure how Axis2 can have a better score than CXF for JSR standards alignment when CXF is the one that actually does implement the various JSR's (JAX-WS, JWS, JAX-RS, etc...) and certifies against them and Axis2 doesn't. 2) CXF has much better support for the varios WS-Security standards including the various profiles like kerberos, spnego, etc... that Axis2 doesn't support. 3) CXF has support for WS-Notification and WS-Discovery and WS-Federation that Axis2 doesn't. 4) Axis2 doesn't support WS-Atomic Transaction, WS-Eventing, WS-Coordination, etc... There aren't any modules at Apache to support those. See: http://axis.apache.org/axis2/java/core/modules/index.html There are 3rd party things that add those to Axis2, but that's the same for CXF. I get a lot of great information from this blog. Recently I did oracle certification course at a leading academy. If you are looking for best Oracle Training in Chennai visit FITA IT training and placement academy which offer PL SQL Training in Chennai.